In those who have restricted calories resulting in weight loss, whether in the setting of a clinically evident eating disorder or even with relative energy deficiency in sport (RED-S), movement of food and waste through the gastrointestinal (GI) tract can be slowed. The exact reason why this occurs is not entirely known though it is believed to be in part due to an attempt for the body to conserve energy during periods of low energy input. Delayed emptying of food from the stomach, also called gastroparesis, can lead to early fullness, bloating, abdominal distension, and nausea. (1) As you can imagine, trying to increase nutritional intake in the face of gastroparesis can be really challenging. Today, we are going to talk all things gastroparesis including symptoms, diagnosis, and treatment. Of note, there are many causes of gastroparesis, but today we are just focusing on gastroparesis that develops in the setting of decreased nutritional intake and weight loss. Gastroparesis can be formally diagnosed through a specific study called a nuclear medicine gastric emptying study. During a gastric emptying study, a radioactive material is placed within a food (generally scrambled eggs or an egg substitute). Images of the digestive tract are taken at varying time intervals, usually with the last being 4 hours after the initial food ingestion. A radiologist will then read the images and determine what percentage of food remains in the stomach at each time interval. In those with gastroparesis, the amount of food retained at these intervals will be higher than those without delayed stomach emptying. Generally speaking, less than 10% of the food should be left in the stomach at the four-hour mark. (2) I have seen gastric emptying studies where nearly half of someone’s food still remained after four hours. It is easy to see why someone would feel incredibly full when their stomach is emptying this slowly! While a formal gastric emptying study can be helpful in certain clinical settings especially where the diagnosis is not clear, they are often not necessary in those with a clinical history of restriction, weight loss, and symptoms consistent with gastroparesis given delayed gastric emptying is felt to be very common in this setting. Instead, empiric treatments can be undertaken without imaging. If symptoms linger despite traditional treatments, a gastric emptying study may then be indicated. The gold standard for the treatment of gastroparesis is increased caloric intake and weight restoration when necessary. There are also several dietary and medication options to help manage symptoms initially. From a dietary end, liquids will more readily empty from the stomach than solid foods so incorporating liquid nutritional into a meal plan can prove very helpful in the early stages of the nutritional rehabilitation process. In addition, foods that are higher in fiber (fruits, vegetables, whole grains) are harder to digest and can increase fullness and bloating. Reduction in fiber intake for a time period can really make a difference. Lastly, eating 5-6 smaller sized meals throughout the day versus 3 larger meals will be much easier to tolerate. In conclusion, gastroparesis is a real medical complication that many people face in the setting of caloric restriction and weight loss no matter what one’s body shape or size is. These feelings of fullness and bloating are real and expert dietitians and physicians are able to help make the nutritional rehabilitation process easier in the setting of gastroparesis. 1. Mehler PS. Anderson AE. 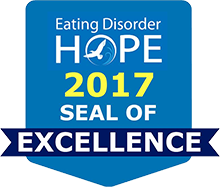 Eating Disorders: A guide to medical care and complications. 3rd edition. John Hopkins University Press. 2017. 2. Gaudiani JL. Sick Enough: A guide to the medical complications of eating disorders. 1st edition. Routledge. 2019. 3. Norris ML, Harrison ME, Isserlin L, Robinson A, Feder S, Sampson M. Gastrointestinal complications associated with anorexia nervosa: A systematic review. Int J Eat Disord. 2016 Mar;49(3):216-37. doi: 10.1002/eat.22462. Epub 2015 Sep 26. Review. PubMed PMID: 26407541.